Solar Arc vs Secondary Progression: Which Systems to Use? Secondary progression (i.e. “a day for a year” method of directing a natal chart) has been around for a long time, but it was by no means the only method of progressing a horoscope. Throughout the history of astrology, astrologers have invented different methods of projecting a natal chart into the future. Right now, Solar Arc and Secondary Progression are the most popular methods used by professional astrologers. Noel Tyl popularized the Solar Arc method (although he still uses Secondary Progressed Moon). There are many fine astrologers using Secondary Progression as their tool of choice, so both methods are here to stay. One of the key differences between the two methods is that in Solar Arc you get to advance the slower moving planets (Saturn through Pluto) that hardly move in the Secondary Progression method, so this tends to add more interpretive possibilities when forecasting. Noel Tyl, who has written extensively about both progression methods, stated that in our modern era, important life changes (e.g. divorce, job change, relocation, etc) occur much more frequently than in previous times – thus we need a method that more accurately reflects the rapid pace of modern life. In Secondary Progression, outer planets are pretty much unusable due to how slowly they move. In Solar Arc, you’ll see natal outer planets located in cadent (3rd, 6th, 9th or 12th) houses crossing an angle within the first 10-30 years of life, frequently representing major restructuring of family unit, home environment, or the profession. Even a fast-moving planet like Venus will have a longer time frame (say 6 months applying, and 3 months separating) to be in orb using a Solar Arc method: this means Solar Arc of Venus aspecting the natal Sun (written Venus=Sun) would last for about 9 months, strongly suggesting the success of a relationship or an artistic endeavor. In transit, Venus moves so fast that it can’t have much of an impact except for a couple days of pleasantness. Similar things can be said of Jupiter, whose transit is fleeting but under the Solar Arc, suggests a 9 months period in which reward or opportunity is likely to be presented. Solar Arc is relatively easy to test in your own horoscope: add 1 degree per year to the natal planets to see how they move and form an aspect with the natal planet. The orb needs to be exact (less than one degree) in order for the Arc to be in effect, and we count hard aspects (conjunction, square and opposition) only. If natal ASC (Ascendant) is at 12 Leo, and natal Saturn is at 22 Leo, this means Solar Arc ASC will conjoin natal Saturn at age 10 (we write ASC=Sat to denote this period), then we ask if there had been a status change within the family around that age: some Saturnian event such as death in the family, sickness, move, or change in father’s position, etc. Conclusion: Secondary Progression vs Solar Arc? 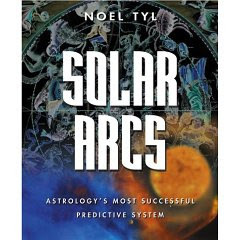 Noel Tyl has written extensively about his method of prediction in Solar Arcs: Astrology’s most successful predictive system. The book is actually a summary of his predictive method incorporating transits, Solar Arcs, Secondary Progressed Moon, as well as Tertiary Progressed Moon. I have a question about my solar arc north node (28-57 Pis). It is exactly opposite my natal Pluto (28-58 VIR) right now. Do I need to be concerned about harm coming my way. Should I be extra careful right about now. And if so, for how long. Thanks for your thoughts on this ! Hi Rosie, Nodal axis events often suggest a meeting, and/or an involvement with groups – in this case (Node=Pluto) there could be an important significance for such a meeting. A friend and I were discussing solar arcs today and a question came up and we thought of you ! Can you let us know how many solar arcs – exact to a natal planet are required to trigger an event. If someone has 4 solar arcs hitting a natal planet exact to the degree at the same time that 3 progressed planets are hitting a natal planet to the exact degree as well as 2 transits exact over a natal planet, would you consider this a lot of activity that would most likely trigger an event, or is this just common activity that happens. Ironically, all of these happen in H5 and House Ruler of the 7th …. we see a theme happening here ! Thanks for your opinion. She says yes, I seems to think if you look hard enough, you are sure to find something when looking at transits, progressions and solar arcs. Thanks for your thoughts on this. By the way, we love your site ! Happy New Year to you and Everyone !!! Astrologers trained to use solar arcs by Noel Tyl (he’s the one responsible for popularizing the method) typically do not include secondary progression, with the exception of secondary progressed Moon (which is important). This way you keep the number of measurements manageable (solar arcs and transits plus SP Moon). With that said, 4 solar arc measurements occurring at the same year would definitely suggest activity that year (know that a degree equals nearly an entire year in solar arc, so you might need to look at the minutes to see how close the occurrences are). Looking at solar arcs only, there are actually 5 in total (not 4). Two are at exact degree and minutes, two are at exact degree and 18 minutes and 20 minutes and the 5th is at 43 minutes. So I think at least four of the five are pretty close to exact as can be. Will be interesting to see what happens – especially since all these happen to occur in 5th and 7th house rulers. Thanks again and enjoy the rest of your evening . thanks for the info. I will have to figure out when to get this done over the next few weeks. I had meant my second saturn return, not solar. I just noticed I have some Solar Arc Progressions coming up and wondered how significant they are. 1. my Solar Arc Progressed Pluto is at 28’24 Libra. On 1-1-18 my Solar Arc Progressed Pluto will be at 0’05 Scorpio. My third House. 2. Mid 2019 my PR Moon hits my natal pluto 3’59 and virgo ascendant of 4’17. 3. on October 26, 2018 my Solar Arc Progressed Jupiter will be at 0’01 Pisces. My natal Chiron is 0, natal mars is 6 and my descendant is 4 degrees. Plus my MC is 29 Taurus. On another post last June I posted about My Solar Arc Progressed Moon is at 3’25’25 Virgo in 12H. You commented that I would start to feel it this October. Do your readings cover all this? When is a good time to prepare for these that occur from 2017-2019? My second solar return will be at 17 CAP in 5H and my Jupiter return will be about the same time – Dec of 2019. My PR moon moves into Leo this summer. I had a nodal return in January of this year and will hit again at 23 Virgo in first house. Not sure this means anything but my Solar Arc progressed vertex is at 24 Pisces, which just passed my natal South Node and Venus of 23 Pisces 7H. Hi Bonnie, the best place to discuss these upcoming measurements will be in a personal consultation, as I’ll be looking at all major transits, arcs and progressions for the next several years. I don’t use jargon in my consultation (please see the consultation page for details) but you can ask me technical questions toward the end if you feel the need. Hi Hiroki, Jupiter in my SA is moving from my natal 6th house into my natal 7th house, it’s been in my 6th house a very long time, it is a little over 1 degree away from my natal descendant, will this improve my relationships and any partnerships? Hi Sandi, that’s noted as Jupiter=ASC, which will be exact in a little over 1 year. This has very nice potentials for any area of life, including relationships. You’ll want to make sure to take advantage of this opportunity through seeking expansive, uplifting experiences and connections. The expression of SA Neptune=ASC really depends on where you are in your life…Please feel free to schedule a consultation if you’d like me to take a closer look at your horoscope. Hiroki – I will try to follow your advice to be patient as I wade through the Neptunian Fog. In the meantime, I think I'll try to make the best of it by finding an appropriate outlet for my artistic talents. Thanks for sharing your wisdom — I do appreciate it. Major measurements like those you listed here suggest a time of profound shift in self perception – at least the opportunity for this is abundantly there, in the form of your current challenges. ASC=Neptune is tricky, and is bound to be accompanied by some confusion for a time. Be patient here. I just took another look, and Solar Arc Uranus just entered my 2nd house several months ago. This 2nd house theme seems to be a recurring one. And in my natal chart, I have a stellium there, which includes my North Node. Hi Hiroki – Solar Arc Pluto is nearing a conjunction (within 1 degree) to my natal Sun (in the 2nd), Solar Arc Mars just squared (and is still within 1 degree) my natal Venus (also in the 2nd), and Solar Arc Ascendant is almost exactly conjunct my Natal Neptune(where else, but in the 2nd). Lately, our financial situation has been challenging, and this has caused me to seriously rethink my “value” to the world, which has been very confusing. If you have any insights as to how to interpret these Solar Arcs, I’d be very appreciative. Thanks very much.